Forgive the title of this particular post, but there really is no other way of describing what we ate on our second full day In Vejer de la Frontera on this mini road trip. Our day with Annie B was filled with great food, chat and plentiful amounts of Fino, Manzanilla and local wines. After a huge lunch, I am not sure either of us really fancied eating another thing for the rest of the day, and we staggered back to our little hotel and collapsed on the bed for an hour’s deep siesta before deciding what to do. 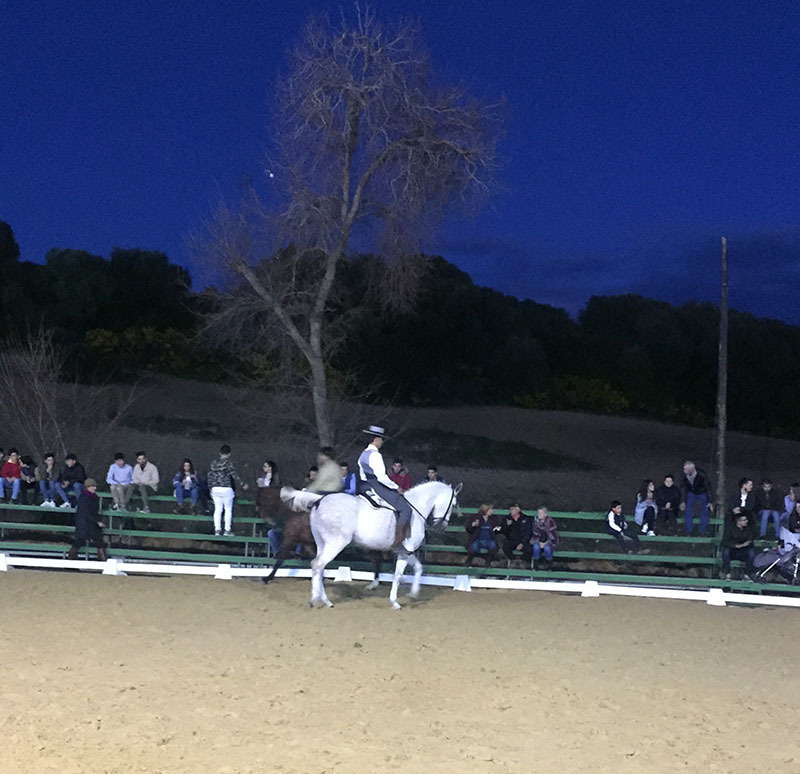 In the last post, we mentioned that the weekend we were in Vejer was also the weekend of their Fería, so once we surfaced we decided to go and check out the festivities, as we both love a Fería. We both still felt decidedly tipsy, and full, but wandered over to the newer part of the town and the site of the fair. The old part of Vejer is seemingly deserted during the Fería, so if you do decide to visit during this week-long party, then be prepared to find shops and bars in the old centre to be either closed or working to some very odd hours. All the inhabitants of the village evidently live at the Fería for the week. Our first drink was a Coke, so you can see the effect that our cooking course had on the pair of us. The thought of tripping the light fantastic in any one of the tented bars was the furthest thing from either of our minds, although Andrew did try to put a brave face on it. There was a promise of live Flamenco, so we sat at a small table waiting in vain for a swish of skirt, a stamp of foot and a strum of guitar. Instead, we watched a poor husband try to cheer up his weeping wife who had clearly had rather too much of the local tincture; husband, wife and son eventually staggered off into the increasingly lively crowd of brightly coloured party-goers. Ferías are the best places for people-watching. An hour can quite easily be spent just watching the comings and goings, the amazing dresses, the young things preening, families gathering in great big groups. All life is here and it is a spectacle, regardless of the size of the town or village. We grabbed a bag of hand-cooked crisps and Andrew managed a Fino before we thought we might head off to find something to eat (I have no idea why food crossed our minds!). We passed the manege [AW: jolly horses jumping around a sand pit] just at that moment when some riders were putting their horses through some paces, so we decided to stop. These horses look magnificent and the riders all really know how to sit a horse. Each rider was rehearsing some form of dressage, and Andrew and I were quite happily admiring the horsemanship (and the clothes), when we were interrupted by a lady who introduced herself as Jackie and who happened to have been head groom to the German Olympic dressage team in years gone by. What she didn’t know about horses wasn’t worth knowing, so after she had declared at least one of the horses to be lame, and the dressage to be of a kind that defied description, we beat a retreat to a tent for fortification, and scuttled off! I wish we hadn’t eaten that night, as I didn’t sleep well. The next day, Spring arrived! It had been a long time coming and we were very pleased to wake to see clear blue skies and sun, as we had planned to make up for lost sleep by spending the afternoon snoozing on a beach. Annie B had suggested we try El Campero in Barbate as a suitable place for lunch. This restaurant, in an unassuming corner of the town, has something of a reputation as being a Michelin-Star-quality restaurant without the Michelin Star. Annie puts this down to the fact that the staff have been here for ages, on the whole, and it is still run as if it were a traditional bar, despite the fact that it is now all dazzling white lines, and cool interiors. As befits Barbate, El Campero is a temple to Tuna, and it was suggested by Annie that we try the Tuna Sperm Lollipop (the mind just boggles). As we mentioned in our previous post, when it comes to Tuna and the eating thereof, no part of the fish is ignored. Off we drove to Barbate and as the day warmed up nicely, we managed to get to the restaurant before all the tables filled up with the fine-diners of the Costa de la Luz. Digressing slightly, some years ago Andrew’s brother, Angus, hit this part of the coast. In those days, Angus may not have been the responsible adult he purports to be these days, and his time was spent on the free and easy stretches of this amazing coastline. When Andrew mentioned Barbate, Angus immediately dropped in the name of this fish restaurant he had visited which was, coincidentally, the very same place in which we intended to nosh on Tuna Sperm! Annie was right: the food here was delicious and we did order the Tuna Sperm Lollipop despite the waiter saying that he was not keen on it himself. He had to repeat that this was, literally, man eggs, and we assured him that we knew this was the case but that he was to bring it on….or words to that effect, in Spanish. We enjoyed crispy Tuna Won Tons, slices of salted tuna stomach (ventresca) and tempura prawns and chunks of tender tuna. The Tuna Sperm looked a little like chunks of tofu (something I’d never eat!) on a stick. The flavour was quite pleasant, but the texture was rather rubbery. Andrew was not keen; I managed to woof my way through the lot, as I thought it would be impolite to leave any. I’m not sure this will be on my list of all-time-favourite dishes, but when in Barbate…. El Campero was a great spot, and we’ll certainly return. After lunch, we retired gracefully to the beach. Playa Hierbabuena, to be exact, just on the edge of town. There are so many stunningly beautiful beaches along the Costa de la Luz, that you are literally spoiled for choice. It is hard to believe that these beaches do get very busy in August, as there are miles and miles of flat golden sands and undulating dunes. We had the beach almost completely to ourselves, apart from a handful of people strolling along with their dogs, or dipping toes in the chilly shallows. There is nothing better than falling asleep in the sun on golden sand, with just the sound of distant birds and gentle waves. That evening, we ate at another restaurant suggested by Annie - Corredera 55, on one of the main thoroughfares in Vejer. The owner of this pretty place is Ellie, another incomer who has made herself very much at home here in Andalucia, and who serves up rather delicious plates of food. The wine here is not bad either. We realised that it would not be cheap to live here, and we rather missed the free tapas that is so readily available on our home turf. I also felt as if I’d eaten half of Andalucia. Our last day of this trip came too quickly. We popped into a cafe below Vejer, where we had had a coffee with Annie, and here we bought a tin of fine tuna as a souvenir for Angus, hopefully to remind him of his misspent early adulthood. We saw an Ibis fly to its ledge on the cliffs above the cafe - another of the items on Annie's checklist. 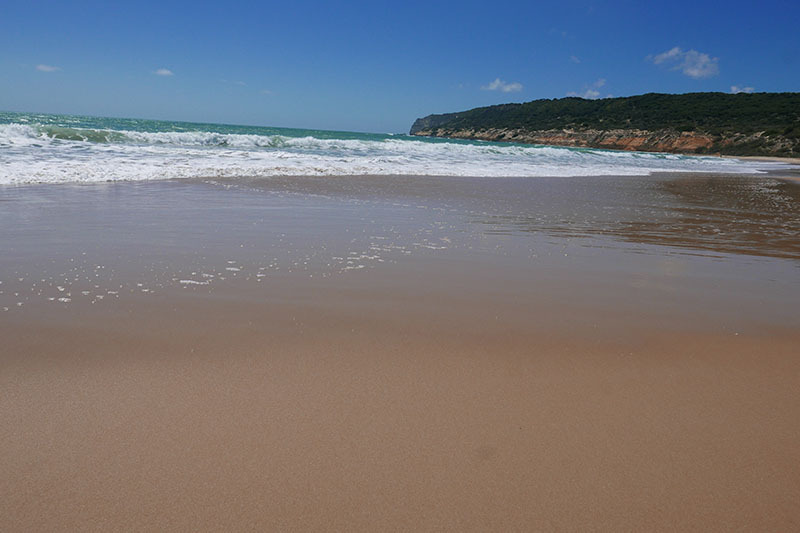 We drove in the sunshine towards Tarifa, taking a quick detour to take a look at Bolonia Beach, one of the better-known of the coast’s beaches. On previous visits here, we had noticed signs to a Roman archaeological site, and this was as much of a draw as the prospect of another great beach. Little did we know that this Roman site is what is left of a complete town, and it is extraordinary. The modern visitor centre gives little away, apart from the expected illustrated timelines and information about the importance of the settlement, but from a window at the end of the building you get a staggering glimpse of the scale of the place, and the setting is magical. The town was originally founded at the end of the 2nd Century BC and sits right beside the shores with views across to the North African coastline. From the Forum, you can gaze down through the still-standing columns, over the sands and out to sea. The amphitheatre is remarkably well preserved and is still used every year, in August, for a classical play festival. This is, without doubt, something that we will return to witness. The site is surrounded by unspoilt nature, and at the end of the beach there is the giant Bolonia sand dune, a 30 metres high swathe of gold cutting through pine and scrub and declared a national monument in 2001. Goldfinches flit over Roman stones and between columns. Wildflowers stretch along gullies next to the Roman aqueduct that carried water to the surrounding residential settlements. The stone road that connects the East and West gates shows signs of the earthquake that lead to the abandonment of the town, as giant flagstones tip and tilt into each other, rudely jolted by tectonic upheaval. We were staggered by the location, the eery feeling that we were transported back in time, into a landscape that has probably not changed that much over the past 2,000 years. Those 2,000 years suddenly seemed no longer than a blink of an eye. If you enjoyed this blog post, then do please free to comment or share it via the social media channels listed below. We always love to hear from our subscribers and readers.